Please help us celebrate with Betsy Dornbusch whose epic fantasy ENEMY releases today from Night Shade Books! 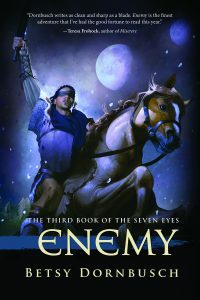 ENEMY is Book #3 in Betsy’s SEVEN EYES trilogy – we’re so excited to have the entire adventure available to readers! In the thrilling conclusion to Dornbush’s Book of the Seven Eyes trilogy, follow Draken as he tries to find peace solace in a life that has been surrounded by bloodshed. Will he avenge those he cares about, while striking down those that stand in his way?